AR15/M4 6 position CAR stock kit with buffer and spring. Manufactured out of a heavy duty composite to ensure high quality and strength. Perfect for military and police applications - adjusts to body armor with six (6)-position adjustable stock. 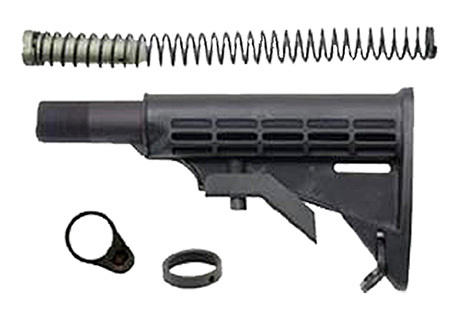 Includes all necessary parts - precision machined aluminum tube, recoil buffer and spring. Ergonomically designed for better comfort. Heavy duty polymer construction. Textured lever to prevent slips when you need it most.